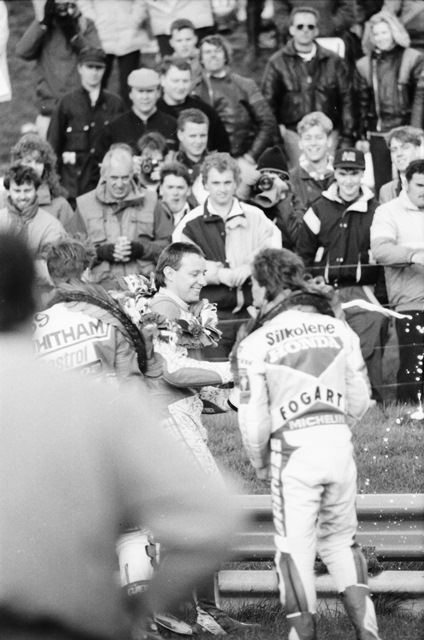 Ray Stringer (center) celebrates victory at Mallory Park along with British teammates Jamie Whitham and Carl Fogarty during the 1991 Transatlantic Match Races. Stringer was the unexpected hero, racing a privateer Yamaha OW01/FZR1000, he was the top scorer on the British squad, who spanked the American’s that year. Why Stringer was allowed to race a 1000cc bike against the 750cc machines of the Americans and rest of the British team, I’m not certain. Regardless Stringer became a hero to the British fans for his performance, perhaps the best and most memorable of his racing career.